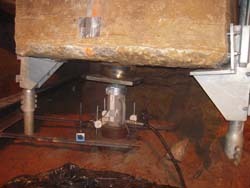 Load testing is performed to verify the actual load capacity of a foundation element. This pile was driven over 50 years ago and supported a building column. EFT safely tested the pile capacity and provided specialty shoring to secure the building. Engineered Foundation Technologies performs load testing for new and existing piles. Load testing procedures are governed by applicable ASTM testing methods. The purpose of a pile load test is to determine the actual load capacity of a foundation pile. Verification of engineering parameters ensures better quality of construction for a piling project. During a load test, a pile is incrementally loaded with a calibrated jack, reacting against an engineered load frame. Pile measurement is measured throughout the loading increments, generating a loading curve. A qualified engineer can determine an actual pile capacity when provided with a loading curve, providing valuable information of the actual pile capacities.